After seven years of operation Accudyne’s Automated Laminator continues to produce flat charges that are formed into fuselage stringers for Boeing’s 787 Dreamliner. 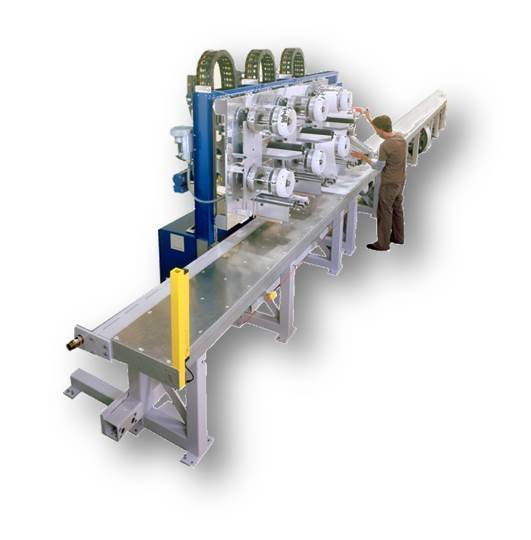 The laminator delivers thermoset prepreg of unidirectional tape, 0/90 fabric and +/- 45 fabric from three distinct supply heads onto a vacuum table. Two separate film heads provide outer face sheets to protect the multi-plied laminate. Laminates are up to 12 inches (305 mm) wide and 36 feet (10.9 meters) long. The machine is capable of local build-ups and drop-offs with a start/stop accuracy of +/- .030 inches (.76 mm). Individual plies are straight to within +/- .030 inches (.76 mm). Material laydown rates are up to 50 lbs/hr (22.7 kg/hr) with the machine producing a laminate every 15 minutes. Automated ultrasonic cutting can be added for trimming laminates to size.